« Apostasy? Who is an Apostate? Many Christians talk about the holy spirit, but few have a clear idea of exactly what it is or how it works in his life, The Bible ascribes many functions to it, including anointing, sealing, the witness of the spirit, begettal of the spirit along with being born again of the spirit. Many of these issues are treated in this issue of the Herald. There are many illustrations used in the scriptures to describe the various functions of the spirit, such as a dove, light, wind, oil, and flames of fire. These pictures are discussed in the opening article, Symbols of the Holy Spirit. The work of the holy spirit is not confined to the New Testament, but is also frequently referred to in the Old Testament. The difference of its functions in the time before Jesus and after are the subject of The Power and the Perception. In the New Testament the holy spirit plays a far more personal role than in the Old as it begins its activities within the Christian as depicted in the article The New Creation. Various chapter of the Bible deal specifically with the necessity of this work within, such as Acts 2, Romans 12, John 14-16, and 1 Corinthians 2. It is this last chapter that is analyzed in our verse-by-verse study feature. It is entitled Spiritual Discernment. There has been much debate over the quotation of Joel 2:28 in the second chapter of Acts. The treatise on Pouring Out the Spirit seeks to shed light on this impelling query. This article is followed by a different solution to this discussion. The On the Other Hand furnishes another solution to the question by one of our editors. The Witness of the Spirit is the next theme to be probed. It answers the question that looms in many Christian minds as to whether or not they have a personal relationship to God and possess the spirit within them. Although much can be said on the various aspects of the spirit’s workings in our lives, perhaps none are of more practical importance than the development of The Fruits of the Spirit, which forms the theme of the next article. The final treatise, The Power of the Highest, deals with certain scriptures about the holy spirit which have provoked numerous discussions over the years. Here the author attempts to shed light on these difficult texts. The importance of the work of the holy spirit in the Christian life can never be over-emphasized. We need to pray for it, seek it earnestly, and endeavor never to quench its influence in our lives. It serves as our telephone line to God and to his Son, Jesus Christ. It is our teacher and our guide. May we ever keep it with us and continually pray for its influence in each of our individual lives. September 2nd, 2011 | 18 comments - be the next! However, divine providence is still different than Divine Intervention which will be accomplished when Jesus Christ the Messiah comes with all of his holy angels for judgement for violation of the sanctity of life issues. Gen 9:6 is incombent on ALL people at ALL times. We see this is now going to shortly come to a head and unless he steps in no flesh will be saved but because of the bride of Christ he will shorten this judgement period so that those who are activly seeking righteouness and meekness will be able to survive. Is Watchtower trying to say they are the only ones that can do this? I understand it to be not of this time period to practice at all. That since the Apostles past that there is no need. Watchtower looks like they are saying that they are the ones speaking to all the world now?? Can anyone help explain what this means?? “Does the speaking in tongues practiced in churches serve as a tool for preaching the good news to people of different languages? “Clearly, modern-day speaking in tongues is very different from the gift of holy spirit given to Jesus’ early followers. How, then, can one discern who has the holy spirit today? Who Give Evidence of Having Holy Spirit? Jesus well knew that the gift of tongues would cease relatively soon after the formation of the Christian congregation. Shortly before he died, Jesus mentioned a timeless sign, or mark, that would identify his true followers. “By this all will know that you are my disciples,” he said, “if you have love among yourselves.” (John 13:35) In fact, in the same verse where God’s Word foretold that the miraculous gifts would eventually cease, it says: “Love never fails.”​—1 Corinthians 13:8. Love is listed as the first of nine aspects of “the fruitage,” or product, of God’s holy spirit. (Galatians 5:22, 23) So those who truly have God’s spirit​—and hence God’s backing—​would show genuine love for one another. In addition, the third aspect of the spirit’s fruitage is peace. Thus, those people who today have holy spirit would be committed to peace, earnestly seeking to rise above bigotry, racism, and violence. Also, recall Jesus’ prophecy recorded at Acts 1:8. He foretold that his disciples would receive power to be witnesses of him “to the most distant part of the earth.” Jesus also indicated that this work would continue “unto the end of the world.” (Matthew 28:20, King James Version) Hence, this international preaching work would continue to be an identifying mark of those who are truly empowered by holy spirit. With what group of people do you find evidence of holy spirit today? Who are manifesting the spirit’s fruitage, particularly love and peace, to the extent that they suffer at the hands of governments because of their refusal to bear arms worldwide? (Isaiah 2:4) Who are endeavoring to avoid the works of the flesh, such as fornication, even removing unrepentant practicers of such conduct from their midst? (1 Corinthians 5:11-13) Who are preaching in all the earth the good news that God’s Kingdom is the only hope for humanity?​—Matthew 24:14. No they don’t claim to speak in tongues they way they did when Holy Spirit was poured out at Pentecost. They do claim to be the only organization to have Gods Holy Spirit. They claim to be the only ones preaching the Kingdom worldwide in multiple languages. And they claim to be the only ones undergoing persecution because of the preaching work. Anyone who does an honest examination of these claims will realize the falsehood. by people for doing what I am doing. I am told by Watchtower because I am not a JW, my voice does not matter. They teach shunning, which takes your own personal God given voice away to even utter one word! understand clearly since so many spoke in different languages. why we dont speak in tongues today. They just turn the answer to themselves and what they are doing!! be no need to speak in tongues for all to understand. due to the only ones spreading the word in all countries and printing in all languages. many as possible. Like the apastles were given the gift to speak to everyone and all languages would hear and understand them. So Watchtower from my view was like they spoke in tongues, and we now spread the word in all languages. – Like they have a special gift now. I know so many Christians spreading gods word all across the world too! But Watchtower says they were the first to ever do this the right way. So they make the reader believe they were given the gifts of the Holy Spirit directly as one group of people and no one else is or was in our day. That is what I gathered from it anyway. Thank you so very much for all the help! Sanura right, they claim having magazines in different languages makes them speaking in tongues so to speak. Bible houses have printed the actual word of God in many languages and continue to do so. Voice of the martyrs get these Bibles into countries where the winesses say they aren’t going because these countries chop your heads off. (pre-annual meeting talk, posted on you tube). The whole world doesn’t even think about what the watchtower magazine or the witnesses say or do. Many have never heard of them nor think about them from decade to decade. Only witnesses and xjw think about the governing body and the so called Jehovah witnesses. If you did a survey you would see they have very little impact on the world. They create their publicity by insisting a child or woman die from the no blood transfusion to keep them in the news. The no flag salutation, the shunning. all of this is publicity. You are one of the most amazing and beautifully spirited people I have ever met in my life! Yes!! I totally understand everything you help us all with my sister and as to why you do it! You all help me and now I need to help others too! I wish when I was a JW that we got to study world religion for what it truly is!! We honestly as Christians have or had no idea of our past history! Christianity has a huge global impact over the entire world since forever! The JW did not start this nor are they at all the only ones with Bible Truth! I was watching all these videos on Ethiopia and the very first Christians on earth. These documentaries truly open your eyes even more to all Gods doings. The Ark of the Covenant is also in Ethiopia today! They are protecting it and no one is aloud to go in see or touch. I know this is God using his power to protect it. Thanks so much for helping me find all these world clues! The Bible touches the entire world with Gods mark! Sanura you are so sweet, if only your parents knew what a beautiful soldier for Christ you are! I am in Chicago now at our 4th Sunday all day convention and guess what. The sisters are the mic carriers. The Bible does not prohibit women from being deaconesses. Two young adult females are doing a great job. Love it! Aw, thank you!!! – Sisters are aloud to do all of that! WOW!!! That is amazing to hear, thank you for sharing!! I can not wait to attend a Bible Student Convention! YAY!!! The fact that I can even attend a Christian Convention at all without being shunned is also AMAZING! All these spiritual gifts just pouring in after completely getting away from Watchtower control in our lives! I can call myself a warrior now for Christ! We all are!!! Just amazing! Jehovah has blessed us all so much I cant even take it! Sanura Moon…..It sure is a lot easier to follow Jesus when we know what he is doing right now and where he is headed. Just read the end of the book first, and get on his program. The devil is a two trick pony. FIRST TRICK: FLATERY…..SECOND TRICK:REJECTION., then the first trick again, then the second trick again…on and one until he total has you jumpin to his tune. Now, for us who live only from our heavenly Fathers smile of approval all this manipulation just runs off our back. We read the end of the book…..Jehovah God wins and we win because we belong to him. Hi Rena – I am on a new path now, God led only. I am a follower of Jesus (Yeshua) and left all man made religion and the Bible Students as well. Love all the groups of people, however all we need is Jesus and our faith, a Bible, and Jehovah God leads the way. I now help in small Christian groups just as the early Christians did and follow what the Bible says only. – The Bible Students are wonderful people, as all Gods people are – but my personal faith has grown a bit differently than what exactly BS follow. – God Bless all on their paths. The interesting thing about the context of Acts isn’t that they spoke in tongues, but what interests me more is that each person listening heard what was said in their own language. The gift also affected those who heard the message. This is very different from what is claimed by those who “speak” in tongues today. 4And they were all filled with the Holy Spirit and began to speak with other tongues, as the Spirit was giving them utterance. Yes!! Exactly about the speaking in tongues! So many are trying to speak in Tongues today but they have no idea what it truly means and why it was used in Biblical times! There were so many different languages then and still are! Today we have translators and the Bible is spread across the world in every single language now! It was all Christians working together to get this accomplished and the Bible is all over the world now! It was not done by just Watchtower!!! Love you all!! Thank you so much!! Sanura the watchtower society only came in around 1927-1931 as witnesses, so they are building on all of the other major Christian religions that have been printing Bibles long before they existed. What narcissist. I think this is why JW HIDE ALL OF THEIR HISTORY!!! Telling us all now, this is new light, the old light is not needed! What they are truly saying is we changed things! I found an article on the Watchtower history of Shunning and its roots of cutting people off and out of their religions and families. It is all Pagan nonsense. The JW say this too is OLD LIGHT! They are the ones who wrote the article in the Awake! HORRIBLE! It was written by them too! All JW need to see this article, Look it up anyone who reads this! Its origins are pagan — supersititious Greeks and the Druids! Sanura I agree with the witnesses on the purpose of the gifts. Normally I read NOTHING that they write or say, in order to be truly free away from the dirt, try to remain free to show God I appreciate what he has done for me. But your postings are special. BUT!Listen to me for a sec. The queen of England is a woman. She has at least 2 grandchildren, she is older than 60, she wears a hat and can have a sharp tongue when provoked. I AM A WOMAN. I HAVE AT LEAST 2 GRANDCHILDREN I am older than 60, I wear a hat and can at times have a sharp tongue. Sanura, THEREFORE I AM THE QUEEN OF ENGLAND! No one else has been or will be the queen of England. Now you see how they fool simple gullible people. Don’t I sound stupid drawing a conclusion that’s based on those true facts, that I am the queen of England. The governing body of Jehovah witnesses dont even try to fool you with complicated reasoning. The people left in there don’t require serious thinking they just accept this dumbed down reasoning. The guys responsible are probably laughing their heads off. They say they are the only people on earth that God talks to and accept as the the true path to him. That you must accept the governing body for God to accept you, quote in their watchtower. Circular reasoning (Latin: circulus in probando, “circle in proving”; also known as circular logic) is a logical fallacy in which the reasoner begins with what they are trying to end with. The components of a circular argument are often logically valid because if the premises are true, the conclusion must be true. (Ephesians 1:13, 14) . . .But YOU also hoped in him after YOU heard the word of truth, the good news about YOUR salvation. By means of him also, after YOU believed, YOU were sealed with the promised holy spirit, 14 which is a token in advance of our inheritance, for the purpose of releasing by a ransom . . . I don’t belong to the organization. Although your last statement suggests this was not a considration on your part, but very like the organization. I assume you are not the “channel of God” his last word as the oganization puts forward. Maybe consider Elijah,and Elisah Or the “spirit of understanding” the last “gift”. I agree it is God’s force to give, but clearly ours to recieve and retain within his will. Travler…Yes, also when we choose to be obedient in all things we then have a “spirit” about us that truly is astounding from the worlds point of view. It is “holy” because it is God breathed into a son of Adam, but it changes us into a child of God. However, Jesus said when we do the right works of faith we are still “doing what we should do”. We can take no credit, it is a gift we allow our hearts to embrace. We are “compelled”. 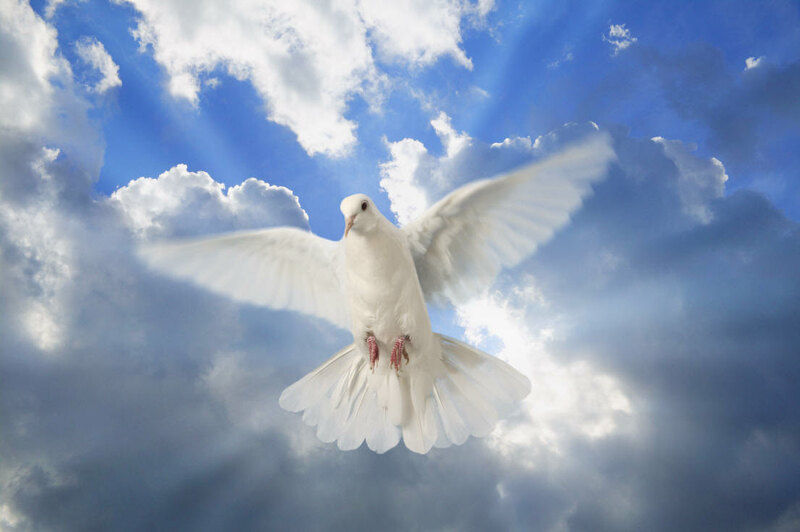 The Holy Spirit was not a White dove; it descended upon Jesus “like” a dove. (Images are dangerous). With reference to what the Holy Spirit is, we should not be saying, “The Bible” ascribes many functions to it … or what “The Bible” says it is. Our mindset should be on what JESUS says or taught it to be. Many keep on referring “The Bible” as if “it” speaks. If Jesus says something, why not ascribe the thing said by him to him saying it. Not “The Bible” saying it. What does Jesus say about Holy Spirit? So the Holy Spirit is something from the Father. What? It is His power. So the Holy Spirit is God’s Power and it can only come FROM the Father to us (at present) through his Son. The Holy Spirit is ALWAYS given. It is always given to do that which cannot be done by “human” power. That Jesus had to be “given” Holy Spirit is a talking point that he was not God. If he was God, he would not have had to be given it. Notice that the Holy Spirit will “given” to “powerless” men to speak what they could not under human power. Notice that we are told that it will be the holy spirit speaking. In other words, it is by God’s power that they speak. Reading further from Acts 4:8-12, Peter mentions God raising Jesus from the dead. In other words, it was by God’s own power that Jesus was raised from the dead. So when Peter was asked the question: “By what power or in whose name did YOU do this?” The answer, by God’s power or Holy Spirit. Many people take people through long complicated iterations about what the Holy Spirit is. It is really not complicated. It is the power gives that enables us to speak or perform acts that we could not do under human power (human spirit). Beware of those who seek to cloud this. Their motive is to teach something “organizational” rather than what Christ taught about it.